Soap should be a unifying theme among us: yes, you too, Mr. Gamer Geek who hasn't left his computer in 72 hours. So, what can nearly every person reading this article say that they share in common? Some may be reading this because they think I'm pretty special (hi mom), some perhaps stumbled upon it in the deepest realms of the internet, and yet others came here because they live the geek life and just can't get enough. With everyone coming here for their own reasons, it could be difficult to pinpoint one commonality among us, yet I can probably say with a certain amount of certainty that we all use soap. Yes, soap. Whether it's in the form of bubbles, liquid or a bar - soap should be one unifying theme among us. Some may use more or less than others (I'm looking at you, mr. marathon gamer who hasn't left his computer in 72 hours). But the general consensus is that we all take showers, bubble baths, wash our hands - something, we all do something with soap. And now, we can all unite our affinity for cleanliness with our beloved geekdoms. Say "hello" to Geek Soap. 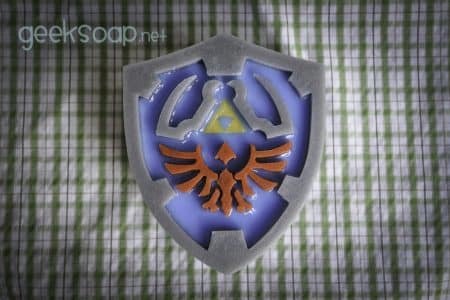 Geeksoap is exactly what you would imagine from the title, a website devoted to selling one-of-a-kind soaps that are works of art as much as they are reminders of our love of all things geeky. At first glance, you may question if this is really the world we live in where you can purchase a soap shaped like the Millenium Falcon or the Tardis. Then after scrolling through the nearly 40 different options, you'll probably think to yourself "okay, I need one of these now." Maybe it's creepy to shove Pikachu-face soap in your crotch?... Nah.